When I hear people saying they're going to the Gillis, I always have this urge to tell them to go to Nusa Lembongan instead. I did go to the after reading about them in Liz Gilbert’s bestselling novel 'Eat, Pray, Love', I decided right then and there that I had to go there myself. So when I travelled to Bali last summer I hopped on a ferry and off I went, only to be greatly disappointed. I have to admit that I did opt for the busiest island, Gilli Trawangan, but what I found was a stretch of western style bars and restaurants along the main street, packed with inebriated backpackers singing karaoke and playing drinking games. It was like being in Soho, the only difference being palm trees and the weather. A walk around the island didn't improve my impressions of Gilli T. All I saw were construction sites, promising larger herds of tourists ruining the island. The underwater world was just as much of a let down. All I saw through my goggles were two lonely turtles swimming among slabs of dead coral. A result of the many boats full of tourists and supplies that moor here, damaging the coral with their anchors. It wasn’t quite the idyllic place that Liz had described in her novel. So when I heard about another supposedly delightful island called Nusa Lembongan near Bali from a fellow traveller I decided to check it out. 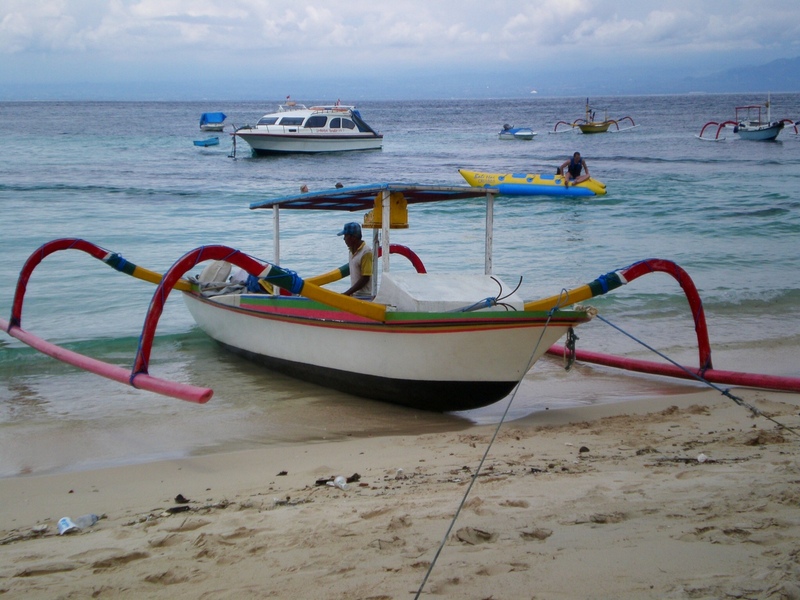 Nusa Lembongan is only about an hour’s boat ride from the harbour of Sanur. Depending on the weather of course, it's a fairly relaxing crossing in one of those spider-like fishing boats with stunning views of mount Agung. After checking in at my guesthouse in Lembongan village, I decided to hire a motorbike and explore the island. Nusa Lembongan is part of Bali so contrary to the Gilli's the predominant religion is Hinduism which is clearly noticeable. As on the mainland of Bali you see the typically Balinese structures and temples everywhere and twice a day small offerings are made to the Hindu Gods in the shape of small flowery baskets. 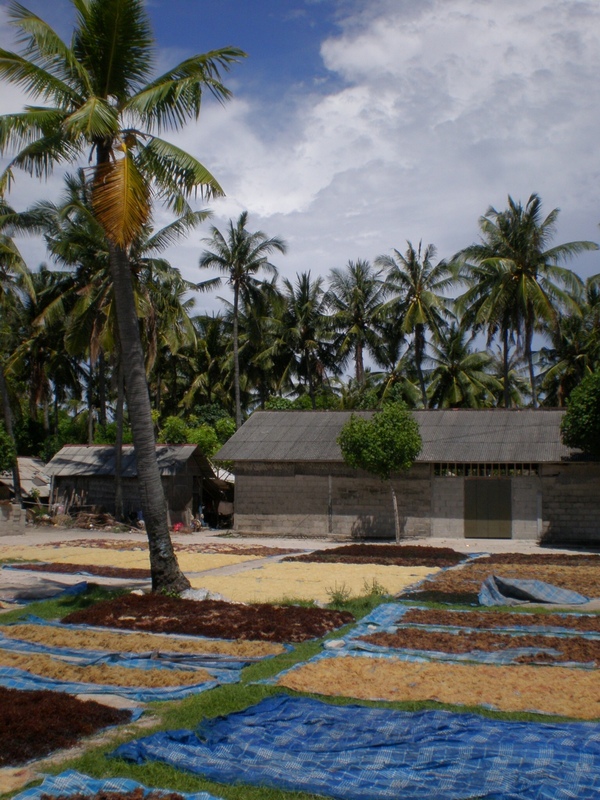 Lembongan Village is the biggest community on the island. There are some bigger resorts on the outskirts of the village, but in town there are mainly some smaller guesthouses. A path runs along the beach which is lined with several bars and restaurants but the atmosphere is very tranquil. No drunken scenes to be found. 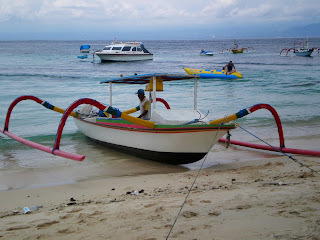 The beach at Lembongan Village is not the most picturesque, but it's a fantastic place to watch the boats come and go. 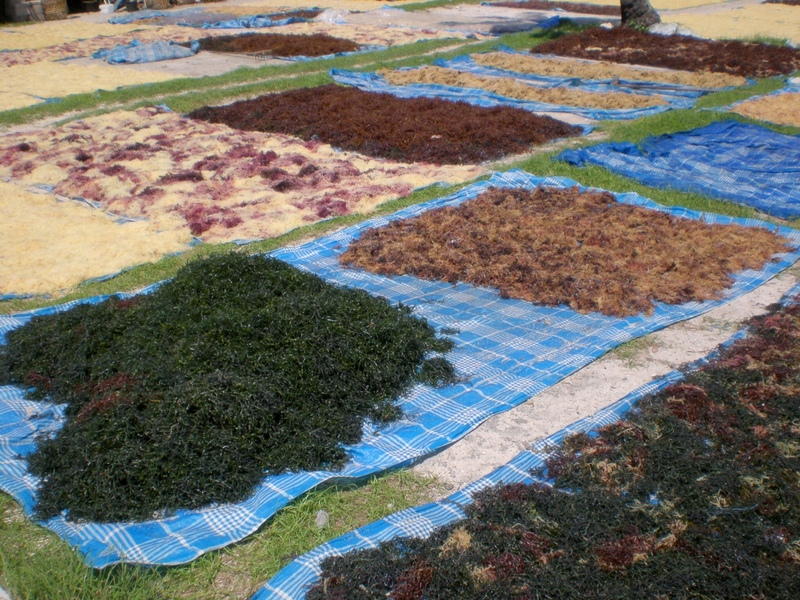 Seaweed is big business on Nusa Lembongan. It's harvested from the sea and then laid out to dry in the sun pretty much everywhere on the island. I'm not sure what it's used for when it's dried, but I've been told it's used in beauty products. A bit hard to imagine as it doesn't exactly smell very pretty, but it makes for colourful displays. The rest of the island consists of car free roads, secluded beaches and stunning scenery. I headed to Mushroom Bay and the other village on the island called Jungut Batu. I checked out Dream Beach and had lunch on Sunset Beach before riding through a mangrove forest. The next day I joined a diving trip to Manta Point and swam among manta rays, other exotic fish and coral that was still alive. At dusk I opened a cool bottle of Bintang before getting comfy and watch the sunset from my private porch. Now this was more like the paradise island I head in mind. Sorry, Liz!